"First off my hats off to the staff they are fantastic and so..."
Have a question for Palawan Secret Cruise Floating Hotel? Welcome aboard Palawan Secret Cruise Floating Hotel, sailing on an endless cruise through the legendary and unspoiled Bacuit Bay around El Nido. From virgin islands to stunning lagoons, Palawan Secret Cruise Floating Hotel offers a wide range of activities such as snorkeling, trekking in the jungle, cave exploration, fishing, kayaking, cliff jumping, and sunbathing on the sundeck. At night, sit back and admire the magical sunset while enjoying a cocktail. Then enjoy the fresh food buffet prepared by the chef and the team. 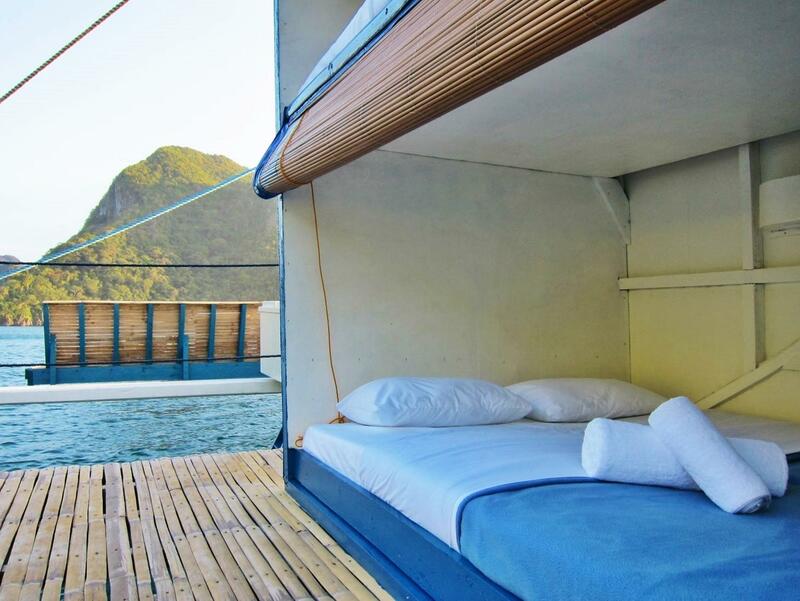 Palawan Secret Cruise Floating Hotel is a 27-meter long Banka boat. Five crew members will make your cruise safe and comfortable. Each cabin is equipped with a luxury double mattress that is four inches thick and premium quality linens including bed sheets and bath towels. Each wing is equipped with a modern comfort room and a freshwater shower. The cruise intends to provide you with the best service so you can enjoy your adventure in El Nido. Expedition dates are subject to change without prior notice due to bad weather. The management reserves the right to amend or change the itinerary without prior notice depending on sea and weather conditions. There are no banks or ATM’s in EL Nido. However, foreign currencies and travelers cheques (very limited options and USD only) can be exchanged in some shops in town. After looking at the cost of separately booking an island tour, three meals, and a hotel, the Palawan Secret Cruise seemed like a good bargain. From pictures online, it looks more luxurious than in person, but if you embrace it more as camping then a proper cruise, you will thoroughly enjoy your stay. After checking in, you'll be ferried to the larger boat where you'll stay. It looks like it does in the pictures with 6 sleeping cabins on each side. According to the staff, the average number of customers at any given time is around four, which means you never feel like it gets too crowded on the boat, or on the tours. As for the tours, there are two outings each day, with each outing visiting 2-3 of the places you'll find on the other island tours. The advantage here is that you'll be visiting at off-peak times and therefore usually be the only group on site. The meals on the boat are great and served buffet style, so you can eat until your heart is content. The deckhands and chef try their luck fishing during the day, and they usually end up catching baracuda or jackfish, which they'll cook up for dinner. If fish isn't your thing, they also offer other main dishes. The food was always excellent. Compared to sleeping in town, being on the boat is like falling asleep in a library. It's very quiet, and the only sound is the water lapping against the boat (which can keep you up if you're a light sleeper). The beds are plenty comfortable for what they are, and the screen is just enough privacy to have your own space. Overall, I really enjoyed my stay here not just for what the boat had to offer, but for the interaction with the people onboard as well. The activity manager and bartender where very friendly and kept things lively. In addition, the fellow passengers were very chatty and by the end of the day, we were all good friends. This cruise is a great way to not only see the beautiful islands of El Nido, but meet some wonderful people along the way. When I booked this it was advertised as a cruise but the engine has broken so it is now actually a floating hotel. First the positives....crew were friendly, the bed on deck was comfortable and of course the location was great. However, since the boat doesn't move you have to get a small boat to the activities. I just stayed 1night and on the first day we left the main boat for about 2hours...the following morning for just under3hours. Food was fine but the minute I got back to land I was violently sick from it. The main boat itself is very basic and should be rated more as a 2star as everything was very basic. If the main boat had cruised around then I think it would have been better value for money. The concept is great but until the boat actually has a motor that works I cannot totally recommend it. Daily islands trips, foods, sundeck. This is a great idea and the boat is newly refurbished. However, it is already beginning to show some wear and tear. The staff is nice but sometimes unprofessional. If you keep a "Filipino" type expectation and not Western, all is acceptable. The only issue we had was the marketing and value for money. This is not 4 Star, more like 2 Star or 3 Star and is bit overpriced. The beds are more like bunks and the bathrooms are rough. YET, if you have the correct expectations (and the marketing is more accurate), this is a cool find. Views at night are stunning, but boat didn't move and "excursions" were limited to same places we had already been on a previous day trip. Great experience, but price is too high for what you get. Brilliant! My highlight ever in travelling around south east asia since 2007. The Cruise actally works as floating hotel right now. Every day captain organize different activities and reach to different places, such as land hopping, snorkling, kayarking. We did cover Tour A, Tour B and Tour C and even more. We explore secret largoons and beaches, and we jump water and have sun-set parties. The crew are friendly, always ready to help. Every day there are travellers come and go. Great fun to talk to them and have mini United union all the time. If I could, I would recommend at least 3D2N stay at the Cruise. It is totally worth any penny and it will reward you an extrodinary and memoriable experience. On check in the managers couldn't be less enthusiastic if they tried. The onboard staff however made up for their shortcomings. The boat is in need of some serious TLC to reach the standards set by the price they advertise it for. A welcome drink and place to sit in the shade upon arrival could have been nice. I also paid for a Cruise however the boat didnt move and we had to move to a separate boat each time we did an outing. So the actual time of the boat was very limited. When I asked the managers about this they again couldn't have cared less and offered no compensation. Its a great concept but defiantly needs some improvements. 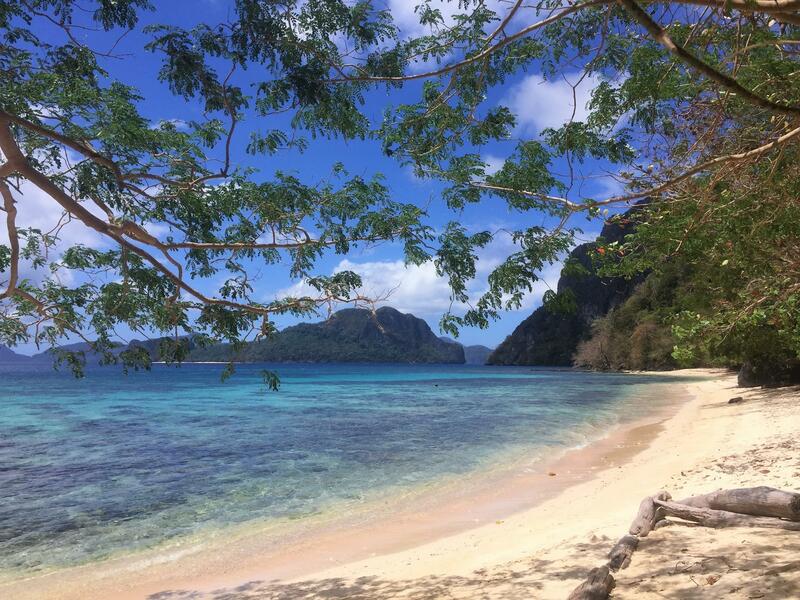 A great place to escape the crowds at El Nido but not much else. EXCELLENT FOOD! FANTASTIC COOKS! INCREDIBLE STAFF! The Secret Cruise was the highlight of our three week vacation in The Philippines. It surpassed our expectations. We were able to tour incredible beaches, coves and snorkelling sites hours before the daily tour boats arrived. The food was the best we had had in The Philippines and we had excellent food throughout our trip. These chefs are exceptional. The staff was knowledgeable and very friendly. As a couple we were free to sit and chat with the staff and guests or share time alone. The star watching is incredible on the ocean as was waking up to beautiful sunsets. We had kayaks and snorkelling gear at our disposal and often set out alone to enjoy private beaches by ourselves to suntan, explore or watch sunsets. Our original one night stay was extended to four nights as we could not leave this experience. After the daily tour boats leave the Palawan Secret Cruise enjoys this exceptional beauty in peace and solitude. Book in advance. When the secret gets out this boat will surely be booked solid. This is the only way to really see the beauty of these islands. The value was exceptional. El personal filipino encantador, tanto en el barco como en las actividades. Solo el "barman/coctelero" francés fue bastante desagradable y nada profesional. De hecho se dedicó a beber y a que una compañera le hiciese masajes durante el tiempo que estuvimos allí. En cuanto al barco, pierde calidad con respecto a las fotos pero fue una buena experiencia. Las excursiones están bastante bien pero dependes de la mar y de que no se les averíe ninguno de los barcos. El barco está fijo en un emplazamiento y vas y vienes con los barquitos típicos filipinos. La comida en general está buena. El barco no tiene todos los servicios que oferta. No tiene nada de lo que se oferta del "bar" (chocolatinas, etc) y nos dijeron que tampoco había masajes. ¿Creo recordar que no tiene wifi? Los baños están medianamente limpios teniendo en cuenta que es un barco y que hay dos baños para todos, que se vacían llenando el cubo de agua en el mar. No hay pila en el baño para lavarse las manos o los dientes. La cama es aceptable. Es un poco incómodo subir y bajar a la cama de arriba. Hay poco espacio para dejar las cosas personales y nos obligaron a dejar el equipaje grande (macutos grandes) en tierra en la oficina. El personal de la oficina muy amable pero me hicieron pagar el fee, que en teoría venía ya incluído en el precio de Ágoda (no en otras agencias). En general a nosotros nos gustó la experiencia pero somos un grupo de gente joven que viaja sin grandes expectativas en cuanto a comodidades y nos adaptamos bastante bien a todo. Ubytování na moři je super, jen původně se loď měla přesouvat, ale měla rozbitý motor, takže stála na jednom místě a na výlety jsme jezdili menší loďkou. Výlety super, protože jsme na místě byli vždy mnohem dříve, než se tam dostali lodě vyplouvající z El Nida. Západy slunce na palubě s večerním drinkem jsou také fajn. Ubytování horší, každý má k dispozici svou kóji, na každé straně je jich 6. Záchod a sprcha společné. Jídlo perfektní, nejlepší na celém Palawanu. Každý den se mění lidé, potkáte spoustu národností. Cena je ovšem enormně vysoká. Vůbec nejdražší ubytování, v jakém jsme kdy bydleli, sice moc pěkné, ale žádné soukromí a bylo by lepší, kdyby loď plula.